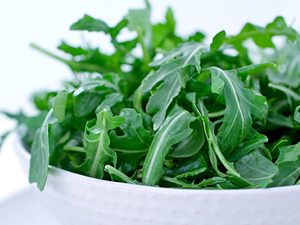 Spicy slightly peppery arugula is a great example of a hearty green that can be used as a salad. These leaves hold up well and won’t go soggy under the oil and vinegar dressing. A nice change from other baby leaf varieties. In a large bowl, whisk together vinegar, water, oil, salt and pepper until blended. Add arugula, mushrooms, tomatoes and onion; toss to mix and coat. Transfer 2 1/2 cups of salad mixture onto each of four salad plates. Using a vegetable peeler, shave paper thin slices of Parmesan over each salad. Yields 1 salad per serving. This entry was posted in Metabolic Medical Center Recipes, Modified Profast (Fast and Flexible) Recipes, Nutriplus Recipes (Balance Your Pyramid), Salad, Uncategorized, Vegetables and tagged Black pepper, Facebook, fast, healthy, olive oil, parmigiano-reggiano, Salad, vegetarian, vinegar by foodies4mmc. Bookmark the permalink.